Behringer XD80USB Review: Is This The Electronic Drum Kit for You? If you are just starting out with playing the drums, it’s always best to keep things simple. It’s easy to become distracted and frustrated if you start with too many variables. If I were a beginner, I would look for a drum kit that is effortless to set up and navigate. The Behringer XD80USB seems to fit that bill. In this Behringer XD80USB review, I aim to give you all the pros and cons, as well as my personal rating of the drum kit. So read on to see if this product can kickstart your drumming! The Behringer XD80USB electronic drum kit has a straightforward set-up, which is compact, user-friendly, and fit for a new drummer. It comes with everything you’d expect from this type of drum kit, plus a little extra! Unlike some $300-$400 priced electronic drum kits, this one includes a working and reliable bass kick drum pedal ready for you to use. A new drummer would have no problem setting up and configuring this drum set, as everything is detailed in the instructions and relatively self-explanatory. However, note that this product does not include a drum throne, suitable practicing/playing sticks, headphones, or a drum amp. 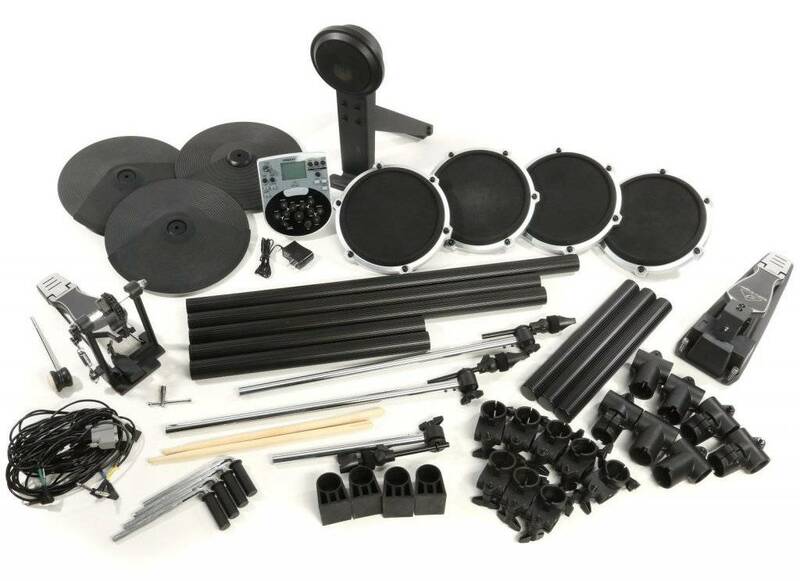 So prior to purchasing the Behringer, or if you’re purchasing your first electronic drum kit in general, you might want to look into getting these accessories beforehand. 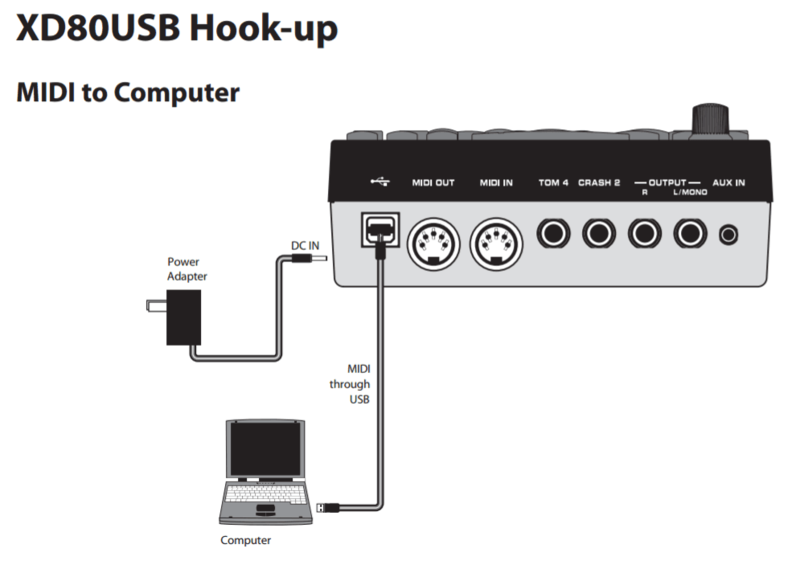 corresponding trigger pad – sound module wiring. The Behringer XD80USB includes a user-friendly sound module that includes an integrated metronome, 15 different drum kit styles (10 preset), 175 different sounds, and a USB port. The USB port lets you relay the sound from your kit, to your computer, into GarageBand or into any recording platform of your choice. The drum kit features dual zone trigger pads which offer a dynamic range of striking variances. For how much it costs, you are definitely getting a sweet sound module. This kit features advanced digital compatibility with the basic structural drum set-up. This means that it is really designed for new drummers that are looking for a simple digital approach to the craft of drumming, but also want something that sounds like the real thing. The Behringer XD80USB houses an icon-driven user interface sound module. This allows you to simply press the corresponding instrument pad on the sound module, and that sound will be relayed through your headphones or external speaker. This functions as a way to test the 175 different drum sounds while producing beats and making music. You can literally have the drum kit at your fingertips. The HDS240USB sound module includes a fully operating metronome which can be set to the tempo you want for practice or even to the beat of your favorite song. Having a metronome is crucial when learning to develop your sense of timing and rhythm. A student using drum tablature can set the metronome to the tempo of the given practice material. This adds a whole new level of functionality to the kit and its potential to help develop a “musician’s ear” or a drummer’s personal style. When you’re just developing an interest in drumming, it’s convenient to have 10 different styles of drum sets ready for you to choose from. The 5 user-programmable set will come to good use once you start to find your own beat. This gives any beginner a wide spectrum of material to experiment with. 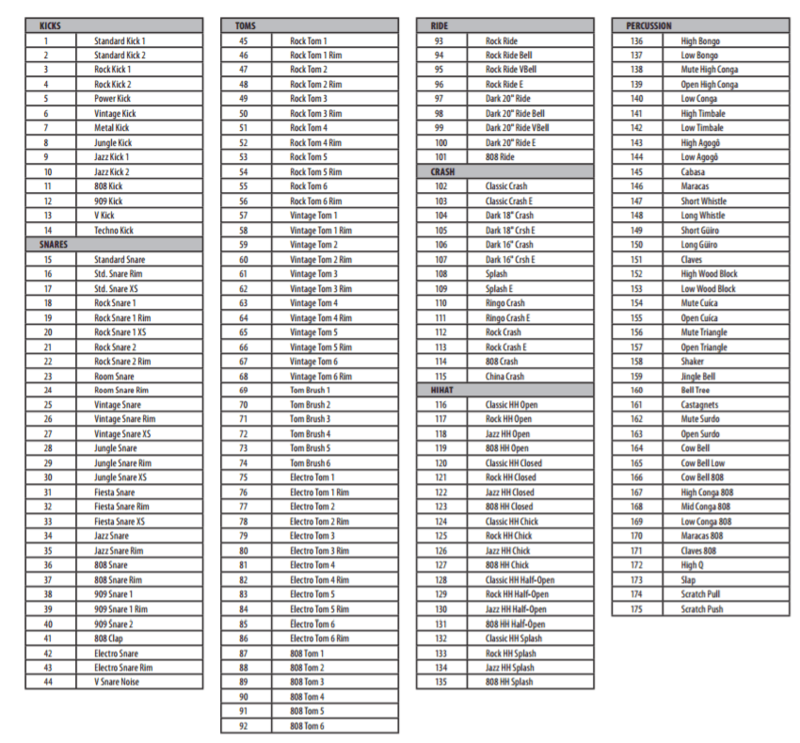 The 175 sounds, which can be set to play on any of the 8 pads, work in tandem with the sound module. The USB port provided let’s you connect the XD80USB into your channel rack, giving you the ability to record authentic patterns and beats while using the 10 different types of drum kit sounds its sound module offers. You don’t need expensive software or detailed programs to record your sound. Easily available software, like GarageBand, is suitable for a beginner’s needs. In addition, this kit can definitely accommodate anyone interested in producing hip hop or electronic dance music. The icon-driven interface serves as a great tool when demoing, sampling, and mixing tracks/loops/etc. The Behringer XD80USB is a great tool for novice drummers, but might not have the capacity to respond to the frequency and force of an advanced drummer. For a student drummer of any age, this electronic kit gives a very versatile sound module with simple and responsive dual zone pads, perfect for someone developing their ear and technique. When played at a moderate and controlled tempo, this kit performs outstandingly. 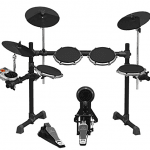 This electronic drum kit offers a coherent sound and drumming experience for a beginner. The dual zone pads and 15 different kit selection allow for you to develop a dynamic ear and learn about striking nuances. The pads provide enough bounce and response for a drummer to experiment with. With 15 drum kit variances, it gives a new drummer a lot of options when they’re still discovering what they like and don’t like. 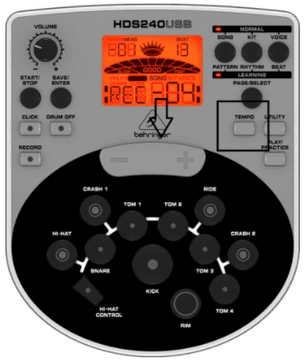 The metronome, sound variances, and digital recording capabilities make this a great tool for any drummer who wants a simple way to make authentic drum rhythms or just to develop skill. Finally, the Behringer XD80 will also most likely be able to satisfy your recording needs for the first few years of drumming. That’s my take and it’s also what Scott Ford shared in the comments. For the seasoned drummer who already has a solid striking pattern and produces consistently quick hits, this drum kit would not last long. The standard foam underneath the padding is only designed to take a moderate hit from a drummer who is not yet into advanced striking and rhythm progression. The relay capabilities of the dual zone trigger pads are not equipped to handle very fast or heavy drumming. Anyone is welcome to buy this electronic kit, but make your decisions in a way that is relative to your overall skill level as a drummer. 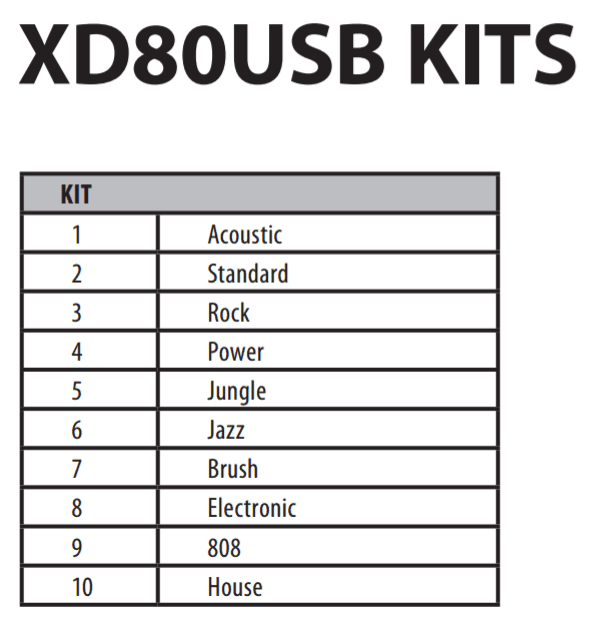 Does the Behringer XD80USB come with drum sticks? And if so, are they of good quality? Yes, this electronic kit does come with drum sticks, however from experience with most electronic kits, the sticks provided are always very poor quality. I recommend purchasing multiple pairs of brand name sticks for practicing purposes. How long can I expect this electric drum kit to last? Does it come with a warranty? A new drummer can expect the trigger pads to hold up for a number of practicing years. You can purchase a manufacturer’s warranty when buying your electronic kit online. Take note that the warranty price can vary from distributor, and is not included in the basic cost. Can a double bass pedal be used with the provided kick drum trigger pad? No, the surface provided is simply not large enough to sustain and respond properly to the amount of force from a double bass pedal. However, a larger kick drum pad may be purchased. Simmons offers a cheap alternative to a larger kick drum trigger pad. If the Behringer XD80USB doesn’t fully convince you, you can check out the Alesis Nitro electronic drum kit. The two sound modules are almost identical in terms of their functionality, they both have an icon-driven user interface, and can integrate seamlessly into any digital recording platform. The biggest difference in terms of quality is the Alesis Nitro has more responsive and durable trigger pads, plus, the hi-hat pedal is also more precise. The quantitative difference is that the Alesis Nitro comes 40 slots for drum kits and 385 sounds to choose from while the Behringer can store 15 sets und comes with 175 unique sounds. Based on my experience and research of the Behringer XD80USB, I recommend this for anyone who’s on a strict budget or simply just looking for a way to kickstart his/her drumming experience. This kit provides all the tools necessary to keep a new drummer interested and focused. On the other hand, to the advanced drummer who is looking for a cheap way to downsize their space and noise foot print, sorry but this electronic kit isn’t for you. It just doesn’t have the durability and sound coherency something a little higher priced would have. 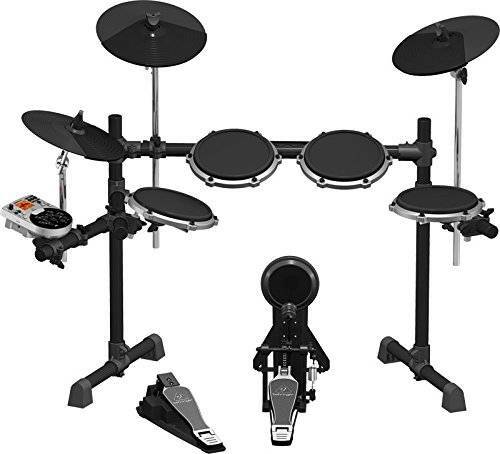 With that said, this electronic drum kit will provide new drummers exactly what they need at a value. Overall, and primarily because of its sound machine, I can say that the Behringer XD80USB is a pretty powerful electronic drum kit for a beginner! Do you have any good/bad experiences with this product? Please share any questions, comments, criticism in the comments below! I have been able to record/edit/mix all of the xd80usb’s sounds into my DAW to a professional quality. I am not at all a professional drummer but knowing the basics of drumming, this kit has been right in the pocket for my drumming needs in my bedroom studio. Thanks for sharing that, Scott! I’m happy this kit works well for you! I’m an semi-experienced drummer, and I normally play my drums not hard at all… I usually rely on microphones cause I hate hitting my drums too hard, even though I like playing hard Rock and fast tracks… Do you think this would be a good match for me? I think with regards to choosing an electronic kit it would be better to ask: what’s your purpose for it? Do you want to practice with it? Then the Behringer or this one are good options. Do you want to take it up on stage? Then I’d recommend you look at forge. Or do you want to home record with your e-kit? Then check out this or that kit. (Obviously there is no limit for top-tier kits and you could also go for something as beastly as this. Do the dual zone cymbals produce good bow sounds and bell of cymbal sounds? Where on the cymbals do you strike to get the different cymbal sounds? Thanks! Sound quality is so subjective that I recommend you check out the set as being played on YouTube and judge yourself (I think the cymbals do sound good). About the bow / bell sounds. 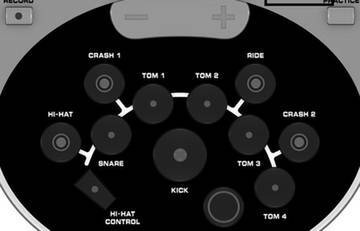 Strike towards the middle of the cymbal to trigger the bell sound – hit the pad anywhere else to trigger the bow / default sound. Yes, Abhik. It does come with one stereo out headphone plus an additional mono output.